Many countries of the world have their national trees and flowers. These trees and flowers are more often than not the symbols of their state or nation, and reflect their cultural tradition, aesthetic tastes and axiology to some extent. Besides, these trees and flowers also reflect the rules of vegetation distribution under certain macro nature environments. 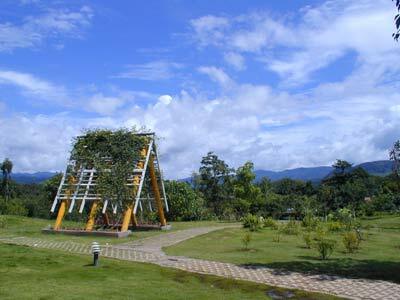 The park of national trees and flowers was founded in 1999; it occupies a land area of 20 mu and neighbors closely with the park of famous trees and celebrities. The park has a short history; however, after years of painstaking labors of the scientists and gardeners, it has successfully inseminated 41 species of national trees and flowers for forty countries of Asia, Africa and Europe. The national flower of Burma �prince of orange (Ixora chinensis), the national flower of Laos - frangipani （Plumeria rubra）, the national flower of Libya � pomegranate, the national flower of Madagascan - royal poinciana(Delonix regia (Bojer) Raf. ), the national flower of Russia � the sunflower, and the national flower of Belgium-azalea all swarm in one park; and there are always flowers in blossom all the year round. Visitors will not only find the flowers in the park are pleasing to both the eyes and minds if they place them amidst the flowers, they would also learn a lot about flowers.